The Flat That Got Away. But There’s Always Another Deal! We hoped to buy from vendor (RBS) sub-£30K if possible, on the basis of what we’d paid (£32,500) for the larger GFF which needed less work. If they wouldn’t agree we were going to purchase the freehold, set up a management co. and try for compulsory purchase. This on the basis they were not complying with their leasehold terms by leaving the flat derelict, allowing squatters to enter thru loft spaces and causing leaks affecting the downstairs flats. I need to pay the least possible, as it increases my yields, allows me to cash-out more on refinance, and just plain saves me money! A spanner was thrown in the works when a mystery buyer appeared and offered £41K. An odd figure, but I’d already phoned the EA posing as a buyer so knew they were telling everyone there was an offer for £40K. 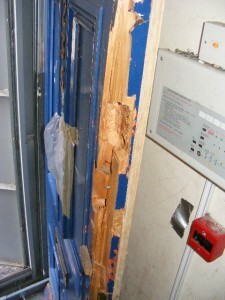 This was a lie, that was our OLD offer which was withdrawn after the squatters re-entered and did more damage. The squatters still have access to the top flat through the roof from the squatted house next door, but we’ve made it pretty clear they mustn’t come downstairs into our flats. We have civil relations with them and I’m confident of getting them out if and when I want. 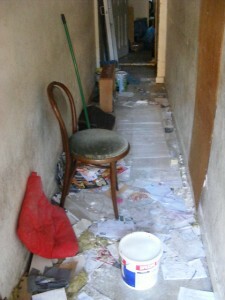 We were worried the mystery buyer might be a slumlord, and sad we’d lose our deal, especially to someone buying blind. You’d have to be a bit desperate to do that IMHO. The bidding was going too high for us, so to avoid a slumlord we asked the brothers who’d bought the basement (for more than they should – it’s their first buy-to-let and they’re a bit naive) if they wanted it and they offered £43,500! This was refused as exchange was imminent! A final odd thing was that on the day of exchange, we were working in the lower flats and there was a loud banging on the front door. Looking out the window we saw two big blokes and a van. They carried on banging and didn’t go for about half an hour. Obviously we didn’t let them in, just kept quiet. Later the basement tenants told us they’d knocked on their door too, and had been quite intimidating. I don’t know what that was about, but can speculate… there’s a new purchaser, who has just bought a squatted flat, then two big blokes come round… That is NOT the way to deal with squatters and the new owner can’t even get access to the top flat anyway! Also he probably doesn’t realise he’s got to lay in new mains cabling and gas pipes, as they’ve been stolen. He will need to come thru our flats to do that. But that’s what you get for buying blind. And the squatters can re-access the top flat any time they want thru the roof voids, or even by taking tiles off the mansard if he blocks the loft in. I am worried where this may lead, the mystery buyer lives overseas (apparently), and has made no attempt to contact us even tho we’ve left phone numbers and email addresses. This is the problem with flats unless you own the whole block. I’m disappointed the brothers from the basement couldn’t buy as they aren’t slumlords. The price was too high for us. The moral of the story is, there’s always another deal. To get the very best deals you must be prepared to walk away many more times than you buy. If you want it too much you will always pay too much. A consolation is we live locally which gives us far more influence and control than someone living overseas.